Bremerton’s Nathan Adrian is nominated for two Golden Goggle awards, the mixed 4×100 free relay and the men’s 4×100 medley relay from the World Championships earlier this year in Russia. 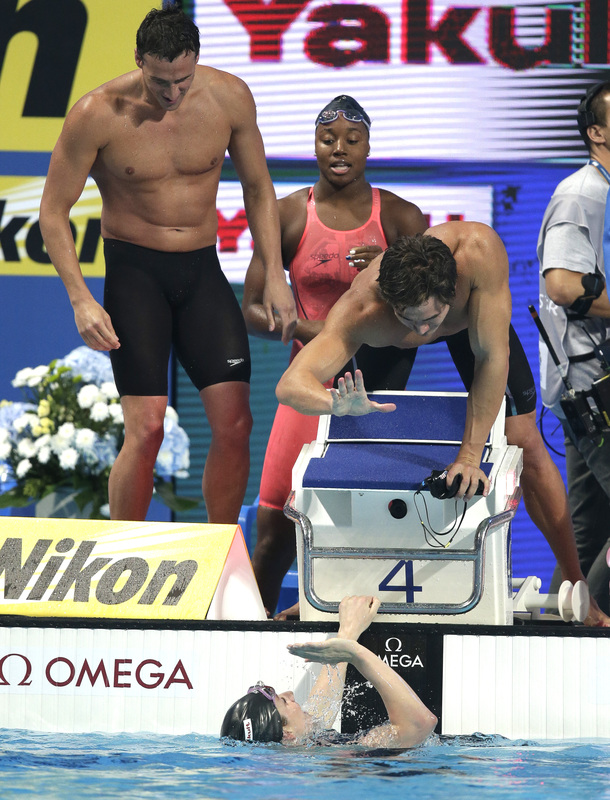 The mixed relay included an all-star cast in Ryan Lochte (48.79 split), Adrian (47.29), Simone Manuel (53.66) and Missy Franklin (53.31). The quartet came in in a world-record time of 3 minutes, 24.51 seconds. The U.S. was behind at various times throughout the race, but Adrian and Manuel pulled the Americans even with Russia and it was Franklin who surged home for the gold. In the men’s medley, Adrian anchored the team that included Ryan Murphy (53.05), Kevin Cordes (58.88) and Tom Shields (50.59) to a gold in 3:29.93, just .15 seconds in front of Australia. The Americans trailed Great Britain and Australia after the breaststroke, but Shields’ strong butterfly leg put the U.S. ahead as Adrian took over. Adrian’s anchor time of 47.41 held off Cameron McEvoy of Australia in the final 10 meters.